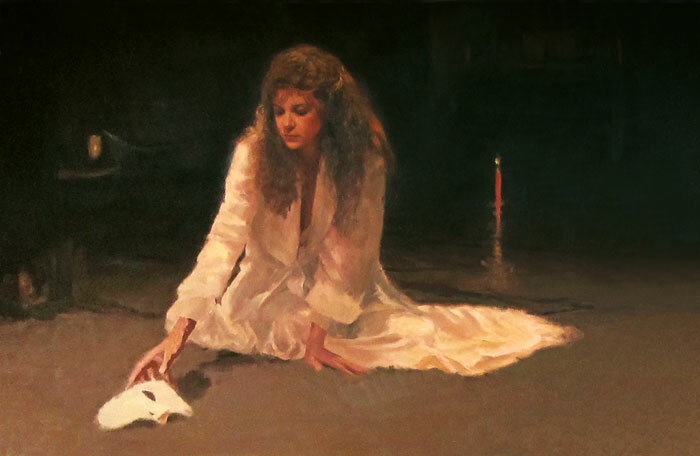 The Phantom of The Opera Gallery spans the artist's works over the past two decades and showcases all of his paintings, sketches and a bronze sculpture. Beginning with his first painting 'Music of Darkness' painted in 1991 to his latest work on the subject 'Thoughts of Forever painted' in 2013. 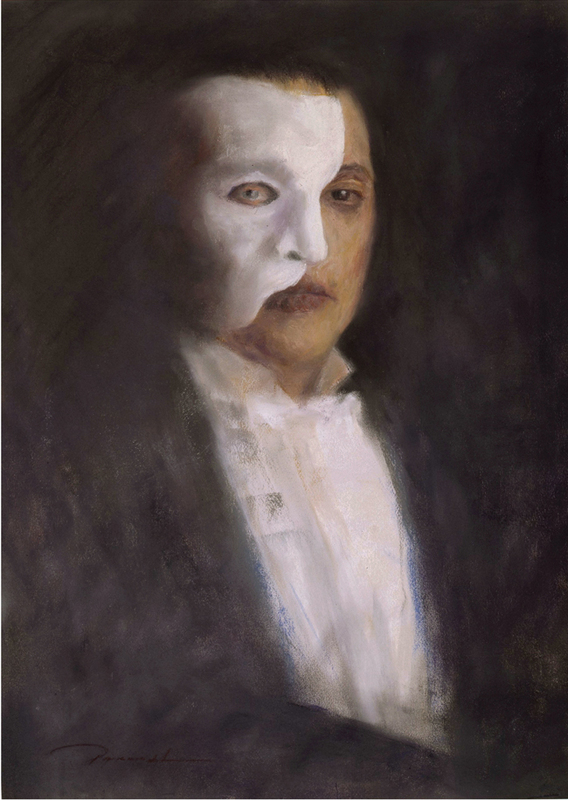 This gallery that takes you on a moving journey of the artists love for the Phantom of the Opera. *Produced as a Signed & Numbered Limited Edition Fine Art Print. Here you can see how Brad occasionally dates and titles his paintings on the back of the canvas, or linen in this case. Here you can see a charcoal drawing as well as the date and title of the piece. *Produced as a Signed & Numbered Limited Edition Print. Brad never finished this painting. This piece required Brad to do an extensive amount of work prior to starting the piece. As the photographs below show, Brad built the boat per the many sketches he drew in his journal. He wanted very badly to complete this work but he had another Phantom of The Opera painting he had to get done first for his publisher to release as a limited edition print. By the time Brad had a chance to work on the piece his inspirational drive on this work had dissipated. Brad will from time to time need to take his vision that he has already sketched in his journal and build a set to see his vision come into being. Here he has set up his model in his studio in the cardboard boat he constructed and painted for this boat scene. The reflection you see in the water below the lantern was achieved by Brad laying down large sheets of Plexi Glass on the floor. 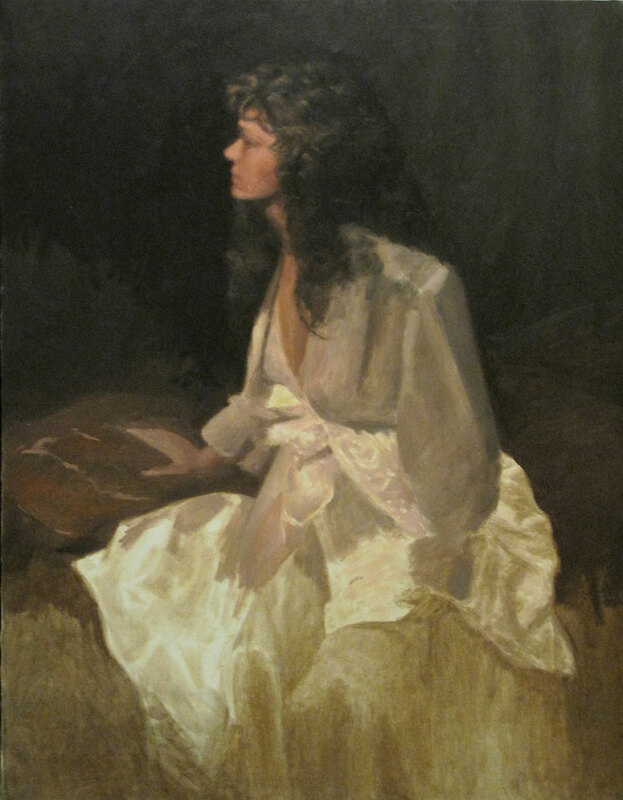 The preparation for this piece took just short of two days. Here you can see that Brad quickly built his boat out of cardboard, scrap wood and duct tape. * The original of this piece is available for sale. For more information please go to the "Available Originals" Gallery. Here is a good example as to how Brad develops his ideas on paper before he hits the canvas.